Hello dear readers! 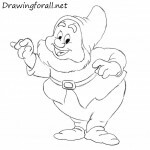 On our site there is a large number of drawing lessons about the mythical and fairy-tale characters. 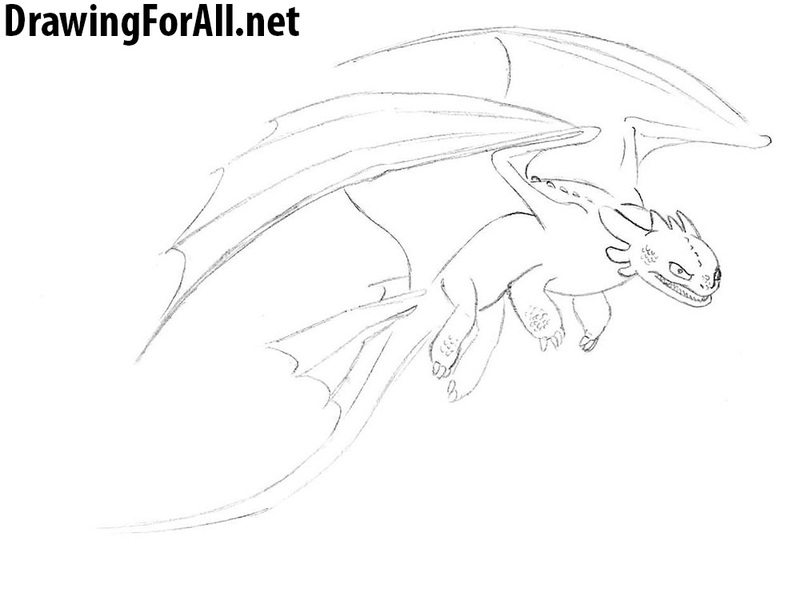 Today, we turn to the dragon named Toothless from very cool cartoon “How to Train Your Dragon.” If, however, the lesson seems to you easy, then you can go to our previous lesson on how to draw a dragon. 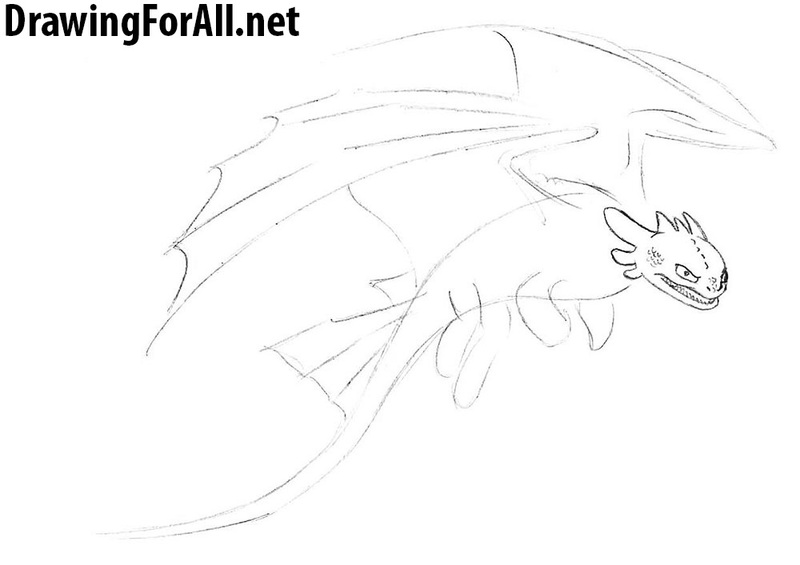 So, let’s begin this lesson and learn how to draw Toothless from How to Train Your Dragon! First outline the contours of the head and long, elongated body. It is very similar to a tadpole – perhaps the dragons in childhood look that way. 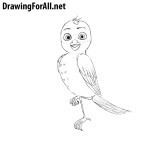 Now draw the short limbs – note, forelegs strongly bent, and due to this they look shorter than the rear. Here we draw the contours of the wings. All of these lines should be very light. And now a very important point. 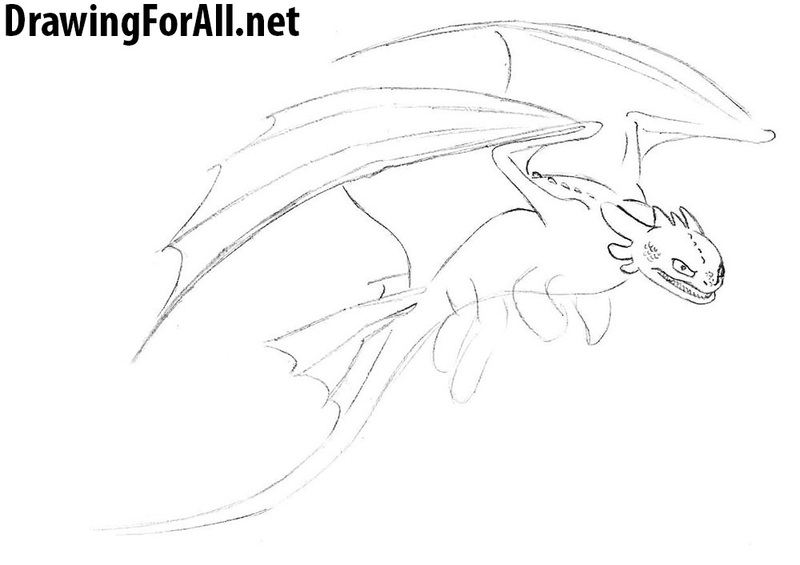 Dragons in the movie “How to Train Your Dragon” are very originally (but, of course, technically and cool) drawn, and one of the features of the exterior is the faces. The shape of the skull is flattened at top, which is why the dragons head looks flat. Eyes are located at a considerable distance from each other. Belowe the eyes draw the wide mouth. On the sides and back of the head draw crests, as in our example. Now draw small teeth on the lower jaw. 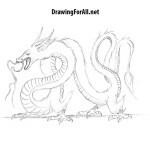 Draw areas with scales. Erase extra guidelines from the head. Circle the lines of the head and face. The contours of the wings are ready, now we need them to draw them. 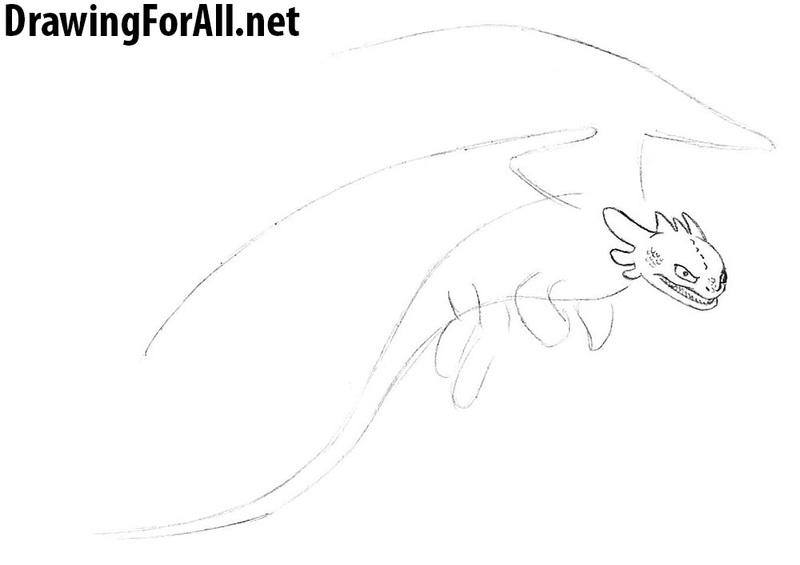 Draw the membranes of the wings. In the same step we outline the contours of the upper part of the tail. Draw the dorsal crest, which begins in the nape area and goes through all the body from the outside. Finally we draw the outer parts of the wings and cartilage, which depart from the body in the area of the back and, in fact, form the skeleton of the wings. Just a small step in it we erase extra lines from legs and draw their contours. Here we draw small claws. Draw areas with scales as we drew it on the face of Toothless. 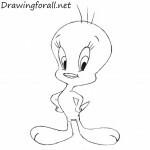 Now we finally clean our drawing – erase all unnecessary strokes, remove stains and guidelines of the previous steps. 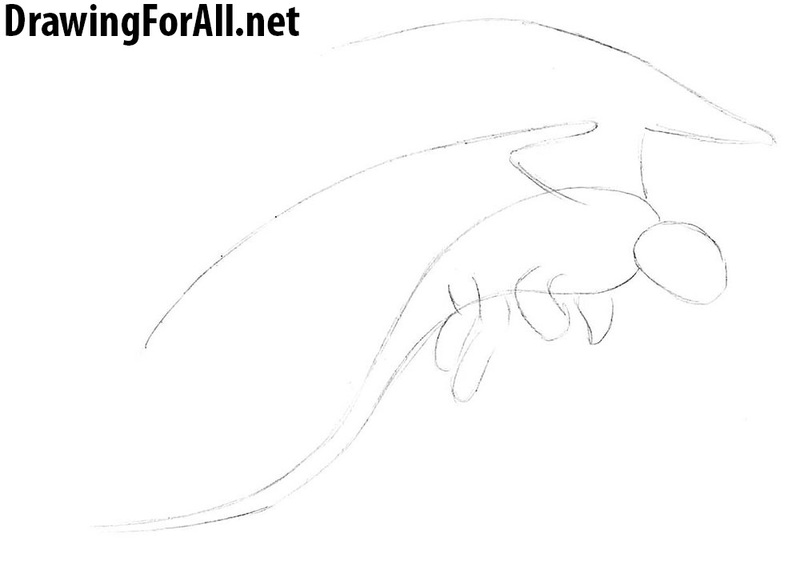 Then draw a portion of the dorsal crest, which is located on the tail, and finally draw the flat tip of the tail. 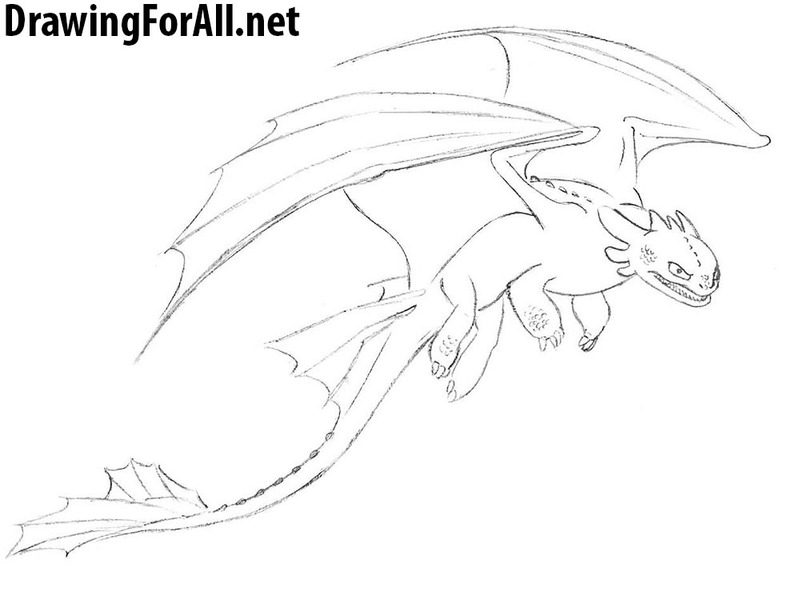 So, the lesson on how to draw Toothless from How to Train Your Dragon come to an end. 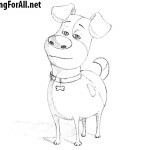 Do not forget to subscribe to us in Google Plus, FaceBook, Pinterest and etc, so as not to miss the new drawing lessons!